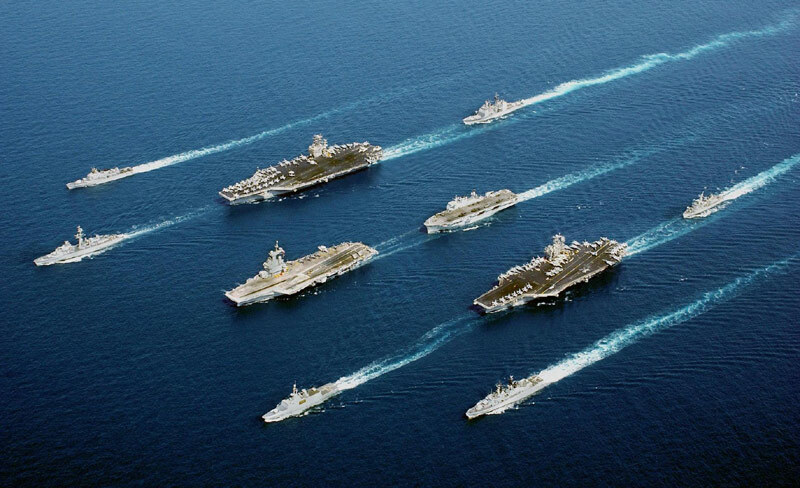 Oman Sea (18 Apr 2002) - A rare occurence of a 5-country multinational fleet, during Operation Enduring Freedom in the Oman Sea. Central Command Area of Responsibility (Dec. 16, 2002) -- Aerial photo of Security Council Coalition ships. 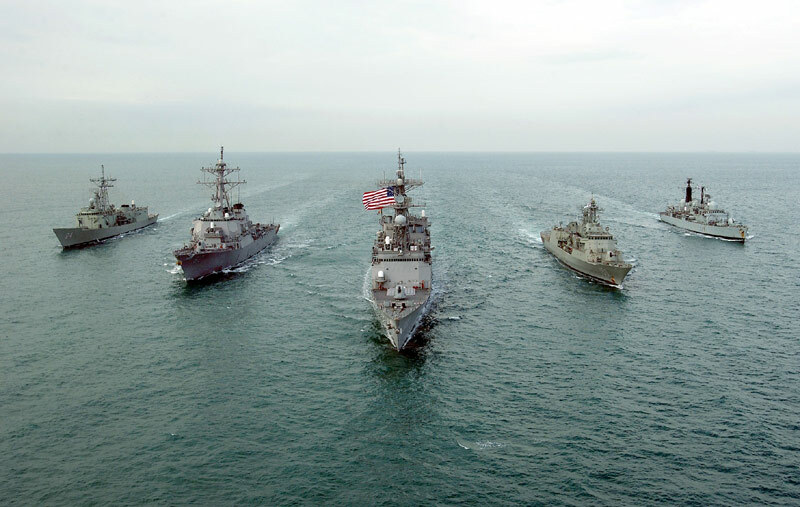 (From left to right) Her Majesty's Australian Ship HMAS Darwin (F 04), the U.S. Navy guided missile destroyer USS Paul Hamilton (DDG 60), the U.S. Navy spruance class destroyer USS Fletcher (DD 992), Her Majesty's Australian Ship HMAS Anzac (F 150), and the British Royal Navy ship HMS Cardiff (D 108). 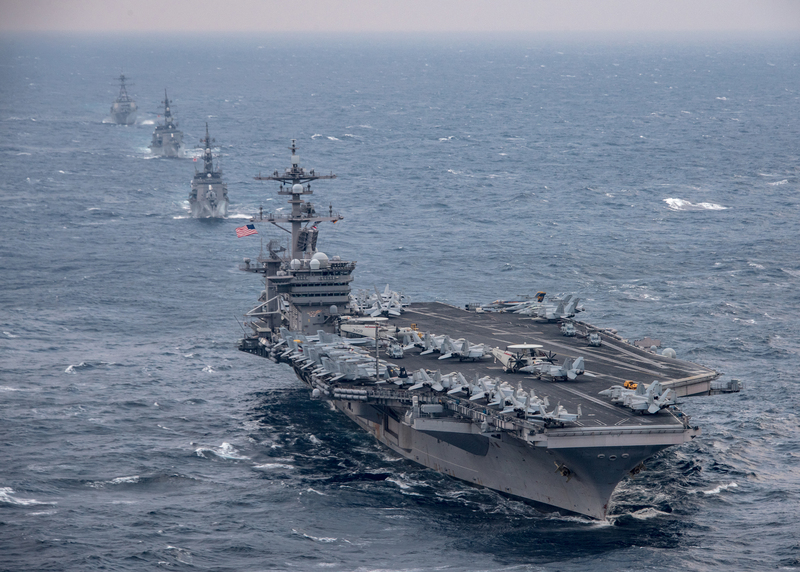 The Security Council Coalition ships are conducting Maritime Interdiction Operations (MIO) in the Central Command Area of Responsibility in support of Operation Enduring Freedom. The Baltic Sea (Jun. 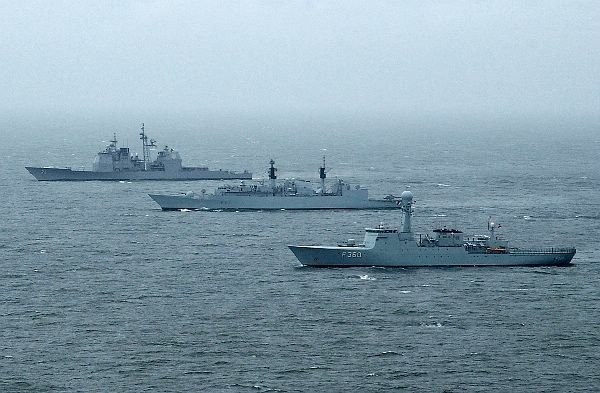 11, 2002)-- The Danish HDMS Hvidbjoernen (F 360), British HMS Chatam (F 87), and U.S. guided missile cruiser USS Cape St. George (CG 71) cruise in formation during the joint combined exercise BALTOPS 2002. The United States and 11 other nations are participating in this year's exercise. BALTOPS 2002 is intended to improve interoperability between allies and Partnership for Peace countries by conducting a peace support operation at sea including exercises in gunnery, replenishment-at-sea, undersea warfare, radar tracking, mine countermeasures, seamanship, search and rescue, maritime interdiction operations, and scenarios dealing with potentially real world crises. 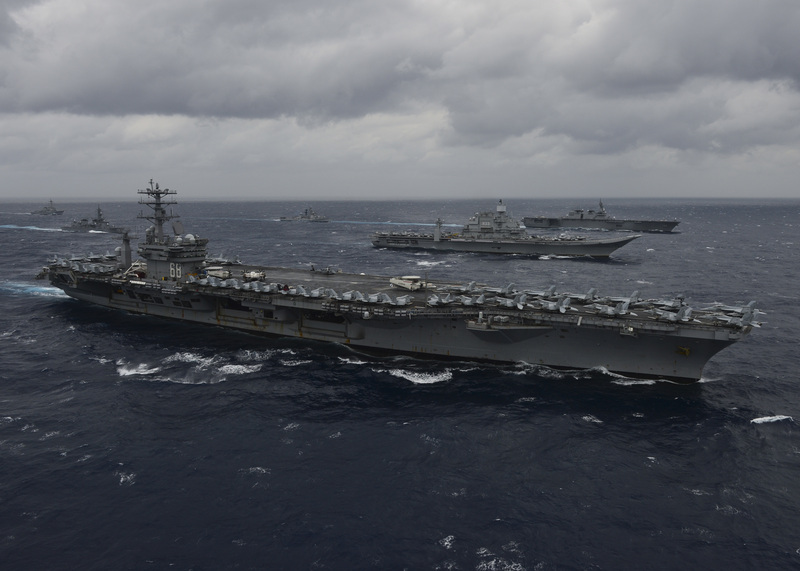 The U.S. Navy, Marine Nationale, and Royal Navy steam together during the mine countermeasure exercise Artemis Trident, an exercise focused on the protection of sea-lanes and the free travel of international commerce in the U.S. 5th Fleet area of operations. IFR 2018 is hosted by the Republic of Korea Navy to help enhance mutual trust and confidence with navies from around the world.